Crème caramel, flan, or caramel custard is a rich custard dessert with a layer of soft caramel on top, as opposed to crème brûlée, which is custard with a hard caramel top. Left: Homemade oven steamed Crème Caramel. The dish has spread across Europe and the world. Both 'crème caramel' and 'flan' are French names, but have come to have different meanings in different regions. In Spanish-speaking countries and in North America, flan refers to cream; this was originally a Spanish usage, but the dish is now best-known in the United States in a Latin American context and also in the Philippines, where it is known more as leche flan. Elsewhere, including in France, 'flan' usually means a custard tart, often with a fruit topping. In Europe and many Commonwealth countries, the dish is generally known as crème caramel. Crème caramel is a variant of plain custard (crème) where some sugar syrup, cooked to caramel stage, is poured into the mold before adding the custard base. It is usually cooked in a bain-marie on a stovetop or in the oven. It is turned out like crème renversée and served with the caramel sauce on top. 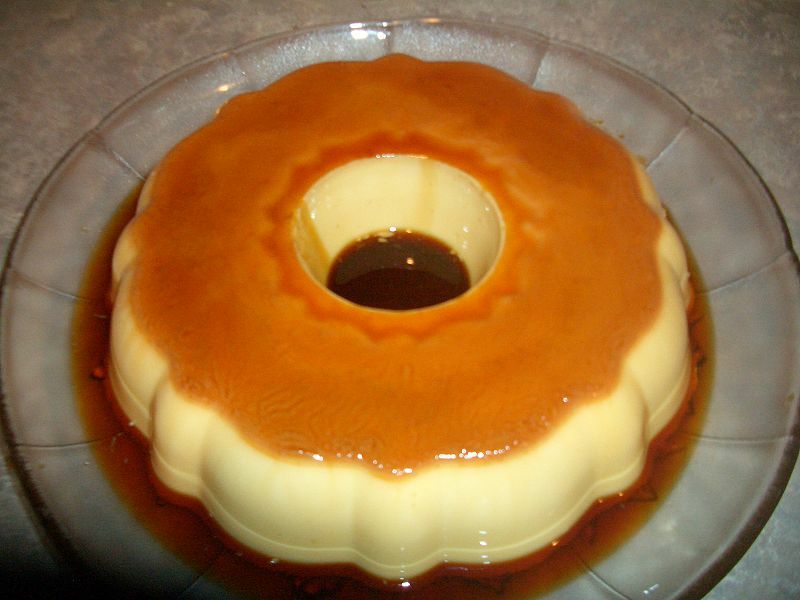 An imitation of crème caramel may be prepared from "instant flan powder", which is thickened with agar or carrageenan rather than eggs. In some Latin American countries, the true custard version is known as "milk flan" (flan de leche) or even "milk cheese", and the substitute version is known as just "flan".